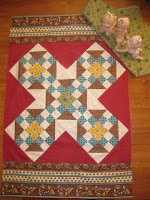 Lurline's Place: New Dolly Quilt ... I Don't Think So! Oh, dear, yesterday wasn't a great day! I am feeling quite frustrated at not being able to continue with my Blueberry Crush, so decided to make a new dolly quilt as I want to try out a new batting for hand quilting before I use it in a larger quilt. 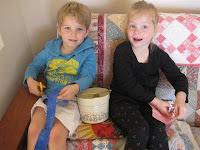 I made this little quilt while baby-sitting my two little helpers, Byron and Heidi. Heidi happily continued to prop herself under my elbow and watch the stitching, while Byron became bored and found the switch that turns the light on and off on the machine. The little ones will spend the night with me while their Mum and Dad have gone to the Ministry of Sound Concert in Perth. The fabrics in the quilt are lovely French and American reproductions ... but now I have decided I don't really like it, so I will have another attempt and see if I can come up with something more to my liking, before continuing on with hand quilting. I also tried to install the Civil War Diary disc with no joy, so will have to wait until Julia and I find a mutually suitable time to get our heads together on it. Also, I have also temporarily lost my stat counter. What a dreadful life we Bloggers lead! Must away and feed the granchildren breakfast now - lucky I can still keep my priorities right. I like the doll quilt, I find it very calming. Not sure I would have put up with a little man playing with my lights while I was trying to sew, you must have the patience of a saint. I love the little quilt, might have to copy and make one for Sophie's doll bed that I bought at Ikea, your little ones are very cute. I like the middle a lot, maybe a small block in each corner and more of the border on the sides. Then I think it would be gorgeous. I agree with the patience part mentioned above, and the kids are beautiful.